As Bloggers & Entrepreneurs, we all look around for the cheapest Hosting plans available on the net. Though Branded Hosting companies like HostGator, Bluehost rarely seem to give huge discounts. Bluehost doesn’t accept coupons as their rates are quite affordable. HostGator’s rates are a bit on the higher side as compared to that of Bluehost’s. They charge couple of dollars more than what Bluehost do for offering the same features. But we have many Coupons for HostGator. Inspite of all this, we do feel the heat of the price we have to pay per month just for hosting few of our sites. You don’t have to wait much longer as HostGator has come up with an Ultimate offer, both for it’s Affiliates & it’s New customers. On Black Friday i.e. Tomorrow the 26th of November they are holding up a Special Offer wherein the new customers will get a lot of Discount. They have specified a time limit for this special Offer. The Black Friday Promotion period begins from 12 AM CST (Central Standard Time) and will end at 11.59 PM CST on the same day i.e. the 26th of November, Friday. Now comes the distribution of time. From 12 AM CST – 5 AM CST you’ll be getting 50% discount on any plan and of any term length. Here comes the bumper offer. From 5 AM CST – 9 AM CST you’ll be getting flat 80% Discount on any plan and of any term length. Mind you this discount is valid for any Hosting package including VPS & Dedicated Hosting. So make sure you are awake during this period & take full advantage of the Black Friday Special offer. You can get additional Discount apart from the 80% offer if you sign up with my affiliate link. The first month’s cost will be cut down to just 0.01$ (a cent). Check the image above for proof. 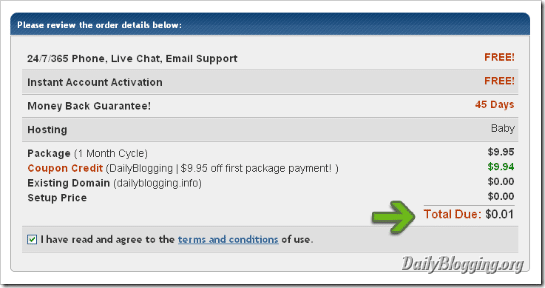 So to avail the 1 Cent Hosting offer for a month’s period Sign-up with DailyBlogging’s Affiliate code. The Affiliate code is displayed below or you can directly Navigate to Our Referral Link for HostGator. Subscribe to Our RSS Feeds / Daily Updates to receive quick Updates on Special Offers & Discount Coupons from HostGator. Do you think the Black Friday Special Offer will increase HostGator’s Sales ? Should Bluehost also allow coupons & hold promotional offers ?? well thats insane and awsome deal. 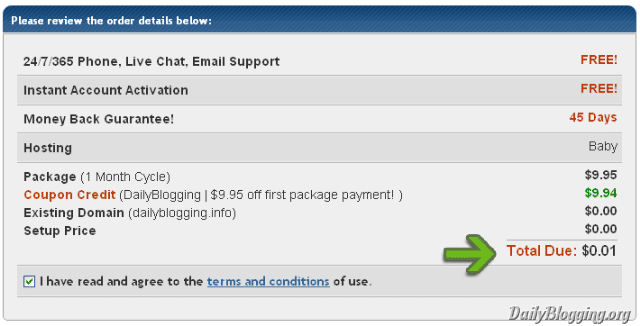 This is really a huge offer from Hostgator, probably the hosting offer of the year 2010. Thanks for sharing. I am already hosting my websites with host gator. I signed up for the Shared Hosting for about five bucks a month. Do these special offers still apply to you if you already have an account with them?